Thessaloniki ( , ), Thessalonica, or Salonica is the second-largest city in Greece and the capital of the Greek region of Macedonia . It is honourably called the Συμπρωτεύουσα Symprotevousa (lit. co-capital) of Greece, as it was once called the συμβασιλεύουσα symvasilevousa (royal co-capital) of the Byzantine Empire. According to the 2001 census, the municipality of Thessaloniki had a population of 363,987. The entire Thessaloniki Urban Area had a population of 763,468. All variations for the city's name derive from the original (and current) appellation in Greek: Θεσσαλονίκη, literally translating to "Thessaly-victory" and in origin the name of a princess, Thessalonike of Macedon, who was so named because she was born on the day of the Macedonian victory at the Battle of Crocus Field. The alternative name Salonica, formerly the common name used in some western European languages, is derived from a variant form Σαλονίκη (Saloníki) in popular Greek speech. The city's name is also rendered Thessaloníki or Saloníki with a dark l typical of Macedonian Greek. Names in other languages prominent in the city's history include سلانيك in Ottoman Turkish and Selânik in modern Turkish, Solun (Cyrillic: Солун) in the Slavic languages of the region, Sãrunã in Aromanian, and Selanik/Salonika in Ladino. It is also known as 'Thess' by Anglophonic diaspora Greeks who returned to Greece and by the troops of the international forces stationed in the various ex-Yugoslav territories who visit the city for their breaks from duty. The Roman odeum in the Ancient Agora of Thessaloniki. The city was founded around 315 BC by the King Cassander of Macedon, on or near the site of the ancient town of Therma and twenty-six other local villages He named it after his wife Thessalonike, a half-sister of Alexander the Great (Thessalo-nikē means the " Thessalian victory") (See Battle of Crocus field). It was an autonomous part of the Kingdom of Macedon. After the fall of the kingdom of Macedon in 168 BC, Thessalonica became a city of the Roman Republic. It grew to be an important trade-hub located on the Via Egnatia and facilitating trade between Europe and Asia. The city became the capital of one of the four Roman districts of Macedonia. When in 379 the Roman Prefecture of Illyricum was divided between East and West Roman Empires, Thessaloníki became the capital of the new Prefecture of Illyricum. The economic expansion of the city continued through the twelfth century as the rule of the Komnenoi emperors expanded Byzantine control to the north. Thessaloniki passed out of Byzantine hands in 1204, when Constantinople was captured by the Fourth Crusade. Thessaloníki and its surrounding territory—the Kingdom of Thessalonica—became the largest fief of the Latin Empire. It also was ruled by the Despotate of Epirus between 1224 and 1246 and was a vassal state of the Second Bulgarian Empire between 1230 and 1246. The city was recovered by the Byzantine Empire in 1246. In the 1340s, it was the scene of the anti-aristocratic Commune of the Zealots. In 1423, the Byzantines sold the city to Venice , which held the city until it was captured by the Ottoman Sultan Murad II on 29 March 1430. Murad II took Thessaloniki with a brutal massacre and enslavement of roughly one-fifth of the native inhabitants. Upon the capture and plunder of Thessaloniki, many of its inhabitants escaped, including intellectuals Theodorus Gaza “Thessalonicensis” and Andronicus Callistus. During the Ottoman period, the city's Muslim and Jewish population grew. By 1478 Selânik (سلانیك) – as the city came to be known in Ottoman Turkish – had a population of 4,320 Muslims and 6,094 Greek Orthodox, as well as some Catholics, but no Jews. By ca. 1500, the numbers had grown to 7,986 Greeks, 8,575 Muslims, and 3,770 Jews, but by 1519, the latter numbered 15,715, 54% of the city's population. The invitation of the Sephardic Jews expelled from Spain by Ferdinand and Isabella, was an Ottoman demographic strategy aiming to prevent the Greek element from dominating the city. The city remained the largest Jewish city in the world for at least two centuries, often called "Mother of Israel." Selanik was a sanjak capital in Rumeli Eyaleti until 1826, and subsequently the capital of Selanik Vilayeti (between 1826 and 1864 Selanik Eyaleti), which consisted of the sanjaks of Selanik, Serez and Drama between 1826 and 1912. From 1870, driven by economic growth, the city's population expanded by 70%, reaching 135,000 in 1917. During the First Balkan War, on 26 October 1912 (Old Style), the feast day of the city's patron saint, Saint Demetrius, the Ottoman garrison surrendered Salonica to the Greek Army without any resistance. In 1915, during World War I, a large Allied expeditionary force landed at Thessaloniki as the base for operations against pro-German Bulgaria, which ended in the establishment of the Macedonian or Salonika Front. In 1916, pro-Venizelist Greek army officers, with the support of the Allies, launched the Movement of National Defence, which resulted in the establishment of a pro-Allied temporary government that controlled northern Greece and the Aegean, against the official government of the King in Athens. This led the city to be dubbed as symprotévousa ("co-capital"). Most of the old town was destroyed by a single fire on , which was accidentally sparked by French soldiers in encampments at the city. The fire left some 72,000 homeless, many of them Turkish, of a population of approximately 271,157 at the time. Thessaloniki fell to the forces of Nazi Germany on April 22, 1941, and remained under German occupation until October 30, 1944. The city suffered considerable damage from Allied bombing. In 1943, 50,000 of the city's Jews were sent to the gas chambers. Eleven thousand Jews were deported to forced labor camps, most of whom perished. One survivor was Salamo Arouch, a boxing champion, who survived Auschwitz by entertaining the Nazis with his boxing skills. Thessaloniki was rebuilt after the war with large-scale development of new infrastructure and industry throughout the 1950s, 1960s and 1970s. On 20 June, 1978, the city was hit by a powerful earthquake, registering a moment magnitude of 6.5. The tremor caused considerable damage to several buildings and ancient monuments; forty people were crushed to death when an entire apartment block collapsed in the central Hippodromio district. Early Christian and Byzantine monuments of Thessaloniki were inscribed on the UNESCO World Heritage list in 1988, and Thessaloniki later became European Capital of Culture 1997. In 2004 the city hosted a number of the football events forming part of the 2004 Summer Olympics. Thessaloniki was hit by strong earthquakes in 620, 667, 700, 1677, 1759, 1902, 1904, 1905, 1932, and 1978. The event of 1978 measured a 6.5 magnitude on the Richter scale. Thessaloniki lies on the northern fringe of the Thermaic Gulf, on its western side. The city has a Mediterranean to Mid-European Temperate climate. Annual rainfalls are about 410–450 mm. Snowfalls are sporadic, but happen more or less every year. The city lies in a transitional climatic zone, so its climate has displayed characteristics of continental and Mediterranean climate. Winters are relatively dry, with common morning frost. Snowfalls occur almost every year, but usually the snow does not stay for more than a few days. During the coldest winters, temperatures can drop to -10C°/14F (Record min. -14C°/7F). Thessaloniki's summers are hot with rather humid nights. Maximum temperatures usually rise above 30C°/86F, but rarely go over 40C°/104F (Record max. 44C). Rain is seldom in summer, and mainly falls during thunderstorms. Thessaloniki is the second largest city in Greece . It is an influential city in northern Greece and the capital of Central Macedonia Periphery, Thessaloniki Prefecture . It is also at the head of the Municipality of Thessaloniki. Architecture in Thessaloniki is the direct result of the city's position at the centre of all historical developments in the Balkans. Aside from its commercial importance, Thessaloniki was also for many centuries, the military and administrative hub of the region, and beyond this the transportation link between Europe and the Levant (Syria, Lebanon, Jordan, and Palestine). Merchants, traders and refugees from all over Europe settled in the city. The early Byzantine walls were moved to allow extensions to the east and west along the coast. The need for commercial and public buildings in this new era of prosperity led to the construction of large edifices in the city centre. During this time, the city saw the building of banks, large hotels, theatres, warehouses, and factories. The city layout changed after 1870, when the seaside fortifications gave way to extensive piers, and many of the oldest walls of the city were demolished including those surrounding the White Tower . The expansion of Eleftherias Square towards the sea completed the new commercial hub of the city. The western districts are considered as a working class section, near the factories and industrial activities; the middle and upper classes gradually moved from the city-centre to the eastern suburbs, leaving mainly businesses. In 1917, a devastating fire swept through the city and burned uncontrollably during 32 hours. It destroyed the city's historic center and a large part of its architectural heritage. A team of architects and urban planners including Thomas Mawson and Ernest Hebrard, a French architect, chose the Byzantine era as the basis for their (re)building designs. The new city plan included axes, diagonal streets and monumental squares, with a street grid that would channel traffic smoothly. The plan of 1917 included provisions for future population expansions and a street and road network that would be and still is sufficient today. It contained sites for public buildings, and provided for the restoration of Byzantine churches and Ottoman mosques. The whole Upper City, near the fortifications, was declared a heritage site. The plan also included a site for the campus of a future University of Thessaloniki , which has never been fully realised, although today's University campus incorporates some of Hebrard's ideas. An important element of the plan was to achieve a fine balance between contemporary urban planning and architectural ideas, and the city's tradition and history. These plans have not been fully implemented, and the city still lacks of a full administrative district. Nevertheless, this aspect of the plan influenced a number of building and planning decisions throughout the 20th century, with inevitable adaptations to service the population explosion of the last 50 years. Thessaloníki is a major port city and an industrial and commercial centre. The city's industries centre around oil, steel, petrochemicals, textiles, machinery, flour, cement, pharmaceuticals, and liquor. Being a free port, the city functions as the gateway to the Balkan hinterland. The city is also a major transportation hub for the whole of south-eastern Europe, carrying, among other things, trade to and from the neighbouring countries. A considerable percentage of the city's working force is employed in small- and medium-sized businesses as well as in the service and the public sectors. In recent years, the city has begun a process of deindustrialisation and a move towards a service based economy. A spate of factory shut downs has occurred in order to take advantage of cheaper labour markets and more lax regulations. Among the largest companies to shut down factories are Goodyear, AVEZ (the first industrial factory in northern Greece built in 1926), and VIAMIL (ΒΙΑΜΥΛ). The Jewish Cemetery of Thessaloniki in the late 19th century. The colourful shopfronts of the central district of Ladadika which used to be the Jewish quarter. Although the population of the Municipality of Thessaloniki has declined in the last two censuses, the metropolitan area's population is still growing, as people are moving to the suburbs. The city forms the base of the metropolitan area . Thessaloniki's Jewish community was largely of Sephardic background, but also included the historically significant and ancient Greek-speaking Romaniote community. During the Ottoman era, Thessaloniki's Sephardic refugee community comprised more than half the city's population and the Jews were dominant in commerce until the Greek population increased after 1912. Within the interwar the Greek state granted the Jews the same civil rights as the other Greek citizens. Many Jewish inhabitants of Thessaloniki spoke Ladino, the Romance language of the Sephardic Jews . A great blow to the Jewish community of Thessaloniki came with the great fire of 1917, which left 50,000 Jews homeless. Some Jews emigrated to other parts of Europe. The arrival of 100,000 Greek refugees settling in and around Thessaloniki after the Asia Minor catastrophe of 1923,also reduced the proportions of the community. During the interwar period they represented about 20% of the city's population. In March 1926, Greece had re-emphasised that all citizens of Greece enjoyed equal rights, and a considerable proportion of the city's Jews stuck by their earlier convictions thought they should remain. By 1944 the great majority of the community firmly identified itself as both Greek and Jewish. According to Misha Glenny, these Greek Jews had largely not encountered "anti-Semitism as in its North European form. By the mid 1940s the prospect of German deportation to death camps was repeatedly met with disbelief by an increasingly well integrated Greek Jewish population. Mordechai Frizis nevertheless became one of the leading Greek officers of World War II. The Nazis exterminated approximately 96% of Thessaloniki's Jews of all ages during the Holocaust. Today, there is a community of around 1000 in the city , and there are communities of descendants of Thessaloniki Jews – both Sephardic and Romaniote – in other areas, mainly the United States and Israel. The tables below show the ethnic statistics of Thessaloniki during the end of 19th and the beginning of 20th century. 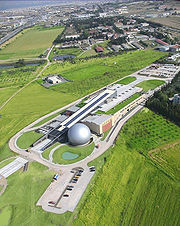 Thessaloniki Science Center & Technology Museum. The Opera of Thessaloniki was founded when the city was the European Capital of Culture in 1997 It is an independent section of the National Theatre of Northern Greece. Thessaloniki is home of a number of festivals and events, including the Thessaloniki International Trade Fair which has been hosted at the Thessaloniki International Exhibition Centre. Over 300,000 visitors attended in 2007. The Thessaloniki International Film Festival has been established as one of the most important film festivals in Southeastern Europe, with a number of notable film makers such as Francis Ford Coppola, Faye Dunaway, Catherine Deneuve, Irene Papas and Fatih Akın taking part to it. The Documentary Festival, founded in 1999, has focused on documentaries that explore global social and cultural developments, with many of the films presented being candidates for FIPRESCI and Audience Awards. The Dimitria festival, founded in 1966 and named after the city's patron saint of St. Demetrius, has focused on a wide range of events including music, theatre, dance, local happenings, and exhibitions. The "DMC DJ Championship" has been hosted at the International Trade Fair of Thessaloniki and has become a worldwide event for aspiring DJs and turntablists. The "International Festival of Photography" has taken place every February to mid-April. Exhibitions for the event are sited in museums, heritage landmarks, galleries, bookshops and cafés. The main football stadiums in the city are the state-owned Kaftanzoglio Stadium , Toumba Stadium and Kleanthis Vikelides Stadium home fields of Iraklis, PAOK and Aris respectively, all of whom are founding members of the Greek league. Thessaloniki's major indoor arenas are the state-owned Alexandreio Melathron , PAOK Sports Arena and the YMCA indoor hall. Other sporting clubs in the city include Apollon based in the eastern suburb of Kalamaria , Agrotikos Asteras based in Evosmos and YMCA. Thessaloniki has a rich sporting history with its teams winning the first ever panhellenic football, basketball, and water polo tournaments. The city played a major role in the development of basketball in Greece. The local YMCA was the first to introduce the sport to the country while Iraklis won the first Greek championship. From 1979 to 1993 Aris and PAOK won between them 10 championships, 7 cups and a European title. In volleyball, Iraklis has emerged since 2000 as one of the most successful teams in Greece and Europe alike with several domestic and international successes. In October 2007, the first Southeastern European Games were organized in Thessaloniki. Thessaloniki, throughout its history has been home for a number of politicians, artists, craftsmen, sportsmen, clergy and singers among others.It is the birthplace of some Saints, as well as politicians such asMustafa Kemal Atatürk. Public transport in Thessaloniki is by buses. The bus company operating in the city is called Organismos Astikon Sygkoinonion Thessalonikis (OASTH), or Thessaloniki Urban Transportation Organization. The construction of the Thessaloniki Metropolitan Railway began in 2006 and is scheduled for completion in late 2012. The line is set to extend over and include 13 stations, and it is expected that the subway will eventually serve 250,000 passengers daily. Some stations of the Thessaloniki Metro will house a number of archaeological finds. Discussions are underway on future expansion, in order to connect the underground with the major transport hubs for the city, the Makedonia Central Bus Station, the Central Railway Station and Makedonia International Airport . Expansions to Kalamaria , the easternmost district of Thessaloniki, and to Stavroupoli in the west, are part of the initial construction phase. Expansion plans include the districts of Eleftherio-Kordelio and the northern districts, such as Toumba. Commuter rail services have recently been established between Thessaloniki and Larissa , covering the journey in an 1 hour 33 min. Thessaloniki was without a motorway link until the 1970s when it was accessed by GR-1/E75 from Athens, GR-4, GR-2, (Via Egnatia) /E90 and GR-12/E85 from Serres and Sofia . In the early 1970s the motorway had reached Thessaloniki and was the last section of the GR-1 to be completed. The city's 6-lane bypass was completed in 1988. It runs from the western, industrial side of the city, to its southeast. Upgraded in 2007, it took in a number of new junctions and improved motorway features. In 2008, the motorway was expanded toward the Egnatia Motorway, northwest of Thessaloniki. The city is a railway hub for the Balkans, with direct connections to Sofia , Skopje , Belgrade , Moscow , Vienna , Budapest , Bucharest and Istanbul , alongside Athens and other destinations in Greece . Air traffic to and from the city is served by Makedonia International Airport , for both international and domestic flights. The short length of the airport's two runways means that it does not currently support intercontinental flights, although there are plans for a major expansion extending one of its runways into the Thermaic Gulf, despite considerable opposition from local environmentalist groups. Not to be confused with the neighbouring Republic of Macedonia. cf. the account of John Anagnostes. "Misha Glenny, The Balkans, page 512"
John R. Melville-Jones, 'Venice and Thessalonica 1423-1430 Vol I, The Venetian Accounts, Vol. II, the Greek Accounts, Unipress, Padova, 2002 and 2006 (the latter work contains English translations of accounts of the events of this period by St Symeon of Thessaloniki and John Anagnostes).